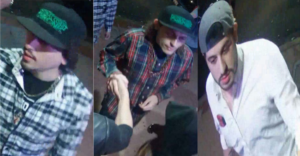 Police are searching for three suspects involved in a stabbing in San Luis Obispo’s Bubblegum Alley last week. Around 12:30 a.m. on July 19, three Hispanic males physically assaulted a male victim at the popular tourist destination with one of the suspects stabbing the victim, according to surveillance footage. Officers arrived at the scene and found the victim with multiple stab wounds to his upper torso and one stab wound to his forearm. Responders transported the victim to Sierra Vista Regional Medical Center where he received treatment for non-life threatening injuries. Medical personnel released the victim from the hospital the same day he arrived. Investigators determined the victim was accompanied by another male during the attack. All of the suspects fled, and officers have yet to locate any of them. Police say all three of the suspects are Hispanic males in their 20s with light complexion. The first suspect is described as being 5 feet 8 inches tall with an average build, black hair down to the mid-neck line and a black mustache. He was wearing a black and white flannel shirt, gold chain and black hat with green writing. The second suspect is described as 5 feet 8 inches tall with an average build, brown hair down to the top of his shoulders and no facial hair. He was wearing a red and blue flannel shirt and the same black hat as the first suspect. Police say the third suspect is 6 feet tall with an average build, short black hair, and a goatee style beard. He was wearing an all-white collared dress shirt with a gray baseball hat on backwards. Investigators request that anyone who has information about the stabbing or knows the identity of the suspects call the police department at (805) 781-7317 or Crime Stoppers at (805) 549-STOP. Two stabbings in two days. Is that what our once upon a time safe, friendly town San Luis has become. This has nothing to do with SLO being a sanctuary city, nor homeless people. These guys do not appear to me to be run of the mill gang members. These guys are probably Sinaloa cartel operators out for a night on the town. The local Sheriff department works with the DEA who in turn protects the Sinaloa cartel in exchange for help against other cartels. These guys are protected by the Sheriff’s department while in town. It’s time for all of you, especially in light of what has come out about the Holland case, to take a good hard look at Ian Parkinson. The homeless have learned that it is easier to be Homeless in SLO or Grover Beach than it is in Fresno or Bakersfield where it is 108 outside. Same free services, but more space to chill and richer people to panhandle from. They need a good gum shoe to solve this one! How much more will it take to get Oprah to take a second look at “beautiful downtown SLO”? Her original assessment definitely needs downgrading! What the heck is happening to down town San Luis. I admit I only go into town maybe twice a month. My last visit I could not believe how many people were sitting around on the sidewalks begging. Quit complaining. SLO is a sanctuary city. So much for being a “Welcoming City”. Time to welcome with a 45 caliber. More happy news from happy town. Don’t suppose there’s any connection between a midnight stabbing and all the alcohol flowing all around bubblegum alley? Downtown’s dead to most of us — a place best avoided. Let the drunks and tourists have it. Shop online. Who are we to judge…we have been told by the left for years that we need a more Diverse Community here in SLO…so now we have the Diversity of Hoodville crime….are they happy now? This my friends is where we are heading not just in California but in SLO, the once happiest city of America.